Ask about my FREE Online Quickie Search for one ancestor!! The Online Genealogist is thankful for… online genealogy!! Boy, have we come a long way in 25 years! When historians look back on genealogy as a whole, there’s probably NO other quarter-century period where SO much has changed. I say for the better, but others mainly those stubborn non-technical types wouldn’t be so quick to jump up and down in excitement for online genealogy and what’s in store for the future. So I thought now would be the perfect time to compare family history research, then (1989), now (2014) and in the future. Remember that old song In The Year 2525? Well, we won’t go THAT far ahead… How about 2025? Which, of course, would be all speculation on my part. Then: The majority of genealogical research is conducted in libraries. Now: A large percentage of genealogical research can be conducted via the internet. Future: The MAJORITY of genealogical research can be conducted via the internet. Then: The research you’re undertaking is heavily dictated by what repositories you can physically visit and when. You’re at the mercy of the hours they’re open and when you can get there. Now: The research you’re undertaking is heavily dictated by the research path you’re following online – 24/7. A MUCH more natural and efficient way to conduct ANY type of research!. The “old” method is seriously backwards and counter-intuitive. Instead of going with the flow, you’re often swimming upstream; researching what you can where you’re at when you can. Future: Even more “now” research and less “then”, which is inefficient and “highly illogical”. Thank you Mr. Spock! Then: A specific research plan can take weeks – even MONTHS – to complete. Now: A specific research plan can take a few hours – even MINUTES – to complete. Future: A specific research plan can take minutes – even SECONDS – to complete. OK, so that’s a bit of an exaggeration, but you surely get the gist. Now: Who Do You Think You Are?, Finding Your Roots, Who’s In My Line? Future: Instant Connections, Ancestral Challenge, Genealogy Update. Then: Hours and hours are spent traveling to and from each research repository. Which adds up to dollars and DOLLARS. Now: You only travel for research if you can’t find what you’re looking for online. And more often than not, you won’t be leaving your chair. Future: You only travel for research if you absolutely MUST. More will be found online, thus less time spent in your car or on a plane. Then: You’re overwhelmed with paper copies. Now: You’re overwhelmed by all the original records online. Future: You’re overwhelmed by immediate access to ANYTHING and EVERYTHING genealogy. Then: You need to make the most of your library visits; often working on several ancestors at once. See counter-intuitive above. Now: You can research your ancestors ONE AT A TIME online. Which is 100 times more productive and a whole lot less confusing. Future: You’ll research your one ancestor with much more ease and less mouse clicks. Then: You either transcribe a document or make a paper copy of it. Now: You either download an image of a record or physically take a digital photograph of it. Then: Correspondence is mainly done via the United States Postal Service. You can expect a reply in maybe a month or two. Now: Correspondence is mainly done via email. You can expect a reply in maybe a week or two at the most. Future: Less and less correspondence will be required, with the immense amount of online offerings available. Then: NOTHING is online because there IS no online! Now: 5% of genealogical records are online. Pffffft! Future: More than 6% of genealogical records are online. Heh. Then: DNA is unreliable and not accepted as evidence in court. Now: DNA is heavily used in our justice system as well as for genealogical research. Future: More and more people will have their DNA tested, thus making it a more reliable and essential research tool. Then: An Everton’s Genealogical Helper subscription is a MUST-HAVE. Now: An ancestry.com subscription is a MUST-HAVE. Future: An All-Access Online Genealogy subscription is a MUST-HAVE. Then: Contacting and connecting to newly-found living relatives can be a chore. Now: Ancestry.com shaky-leaf hints, Facebook, email, Skype, etc. So, as you can see, I am VERY optimistic regarding the future of genealogical research; especially online. The speed and sheer numbers of digital records being added DAILY is mind-boggling. In this day and age, those not embracing all this technology are at a serious disadvantage. Even if you visit a repository in person, the first thing they’ll have you do is get onto one of their computers to access what they’re already offering online anyway. So, there’s no excuse NOT to be keeping up with the times and taking full advantage of EVERYTHING online research has to offer!! 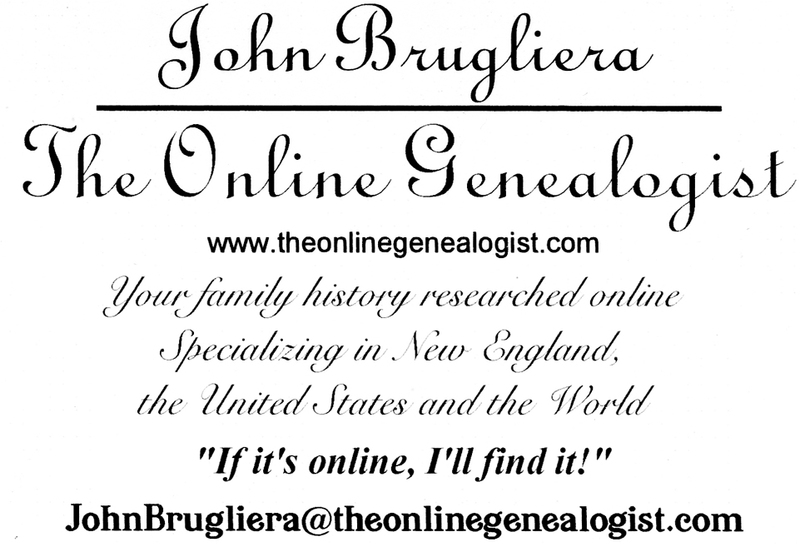 Then: John Brugliera, Genealogist. Zero clients. Now: The Online Genealogist. Several clients. Future: The Online Genealogist Co., Inc. Hundreds of clients!! The Online Genealogist is going to Master Genealogical Proof!